1, 2 and 3-night tours + services for independent hikers. 2 days / 1 nights at Saltwater Creek. Includes lunches, pre-dinner nibbles and drinks, dinner and sweets by the campfire, hot showers. Great for the time poor! 3 days / 2 nights with overnight luxury camping at Saltwater Creek. Includes lunches, pre-dinner nibbles and drinks, dinner and sweets by the campfire, hot showers, tour of Green Cape Lighthouse and more. $990 per person twin share. $1,250 per person single tent. 2 days / 2 nights with one night at Green Cape Lighthouse Cottage and one at Saltwater Creek. 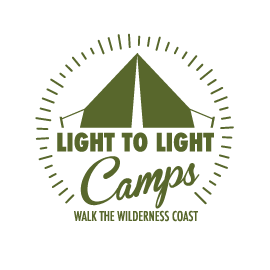 Includes lunches, pre-dinner nibbles and drinks, dinner and sweets by the campfire, hot showers, tour of Green Cape Lighthouse and more. $1,100 per person twin share. $1,400 per person single tent, twin share @ Green Cape. 3 days / 3 nights with overnight luxury camping at Saltwater Creek and finishing with one night at Green Cape Lighthouse Cottage with catered meal. Includes lunches, pre-dinner nibbles and drinks, dinner and sweets by the campfire, hot showers, tour of Green Cape Lighthouse and more. $1,200 per person twin share. $1,450 per person single tent, twin share @ Green Cape. 2 days with 2 night luxury camping at Saltwater Creek, including meals, drinks, hot showers, discovery tours around Saltwater and optional kayak tours on the pristine creeks – inaccessible by foot. $990 per person, twin share. Optional Extra: +$110 per person guided kayak tour. We also provide transportation and food drop-off for solo hikers. Check out our Transfers page or Contact us using the contact form below for more information about those services. Our basic transfer prices start from $200 per car full (up to 4 passengers with big packs or 6 passengers with day packs) for transfer from Eden to Boyd’s Tower and pick up from Green Cape for return to Eden. We can pick up from Merimbula for an additional fee. Talk to us about your group’s needs. See Contact form below. We’ll reply within 24 hours. The iconic 31km Light to Light Walk follows some of southeast Australia’s most spectacular coastline. Select one of our tour options or call us to discuss your needs.